Beyoncé's new film and Madonna's new Madame X alter-ego discussed, Aletta Collins on changing West Side Story's choreography, is reading between 7 and 12 the most formative time. Two female icons of the music industry release new works today. Beyonce’s new film Homecoming is released alongside a surprise new live album. 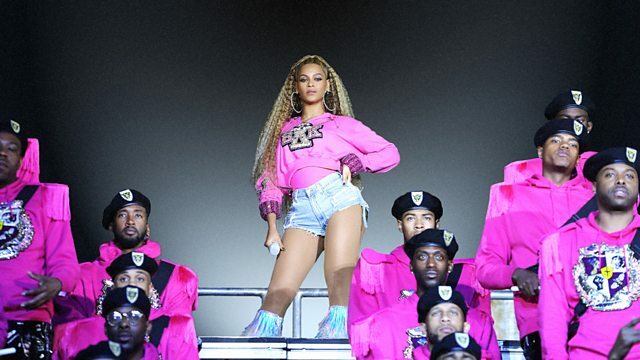 The film focuses on her historic 2018 Coachella performance in which she celebrated America's historically black colleges and universities, black culture and black female empowerment. Also today, Madonna releases a new single ahead of her upcoming album and has revealed a new alter-ego - Madame X. Academic Emma Dabiri and broadcaster Katie Puckrik discuss Beyonce’s cultural significance and Madonna’s latest reinvention. Choreographer Aletta Collins talks about her work for the Manchester Royal Exchange’s new production of Leonard Bernstein and Stephen Sondheim’s classic, West Side Story. She reveals why they chose to change Jerome Robbins's famous choreography, the first time a professional production has done so. Ahead of a Front Row bank holiday special on children’s literature, two award-winning writers of children’s fiction, Katherine Rundell and Bali Rai, discuss the significance of reading between the ages of 7 and 12.